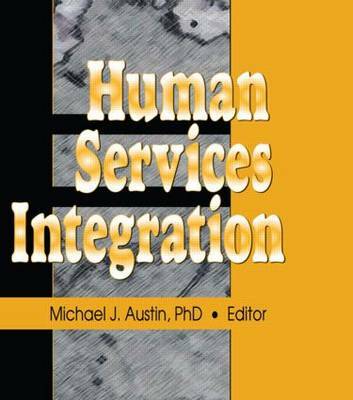 Addressing the multiple meanings of service integration, Human Services Integration analyzes how motivations and expectations for social service integration differ significantly among different players in the service system. In a period of major budget cutbacks and welfare reform, however, it is important that service providers collaborate to reduce or eliminate boundaries between categorically defined and provided services. This book tells you about the efforts being made to provide existing services more efficiently while avoiding duplication and waste. As you will quickly see, developing consensus for service integration efforts at the administrative, community, and staff levels will result in the ability to set achievable goals and objectives and secure cooperation at all levels.Human Services Integration covers practice principles for managing organizational and community change and offers strategies for organizing human service agencies and overcoming fragmented service integration in communities with complex problems and needs. To also help you identify specific service intergration activities that are relevant in the context of unique communities, it discusses: specifications for conducting a self-assessment of progress at the local level toward social service integration goals Georgia's Family Connection, a statewide human services initiative interweaving formal and informal systems of care in a community-centered approach to service integration a children's initiative collaborative social science theory pertinent to service integration gathering support from elected officials such as boards of supervisors, city leaders, and local elected boardsHuman Services Integration will help you understand why service integration cannot be defined by a particular service model or outcome. Its insight will also help you understand why involving service users and community members in the design and delivery of services is fundamental to developing an integrated service system that is culturally competent, empowering, and responsive to its neighborhood and community context.